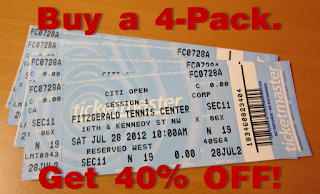 How to get Citi Open Tickets 40% OFF - only about $36/ticket for the Finals!! See our full Citi Open Coverage, previews and photos here! Citi Open is now Washington DC's biggest tennis event for both ATP men and WTA women. It is also the next stop on the US Open Series, leading up to the US Open 2012 grand slam coming up next month. Tickets at the box office this week (July 30-Aug 5) are priced $45-$55/ticket. Tennis-Bargains can help you get them down to $31-$36 for any session you want; plus you can even get $25 back with one tweet* (exp 9/30)! Triple Play Tips for Savings is like "A-B-C"
Note: yes they are nosebleed seats but if you are planning to see only non-stadium matches, it's not a problem. It's "first come first serve" seating on the Grandstand and all other side courts. 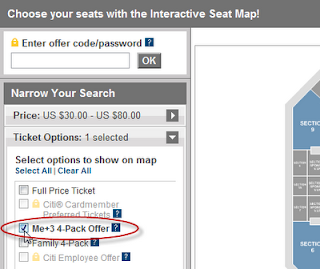 **Don't let your unused tickets go to waste! ** - Another fan is probably looking for one, especially on sold-out days. 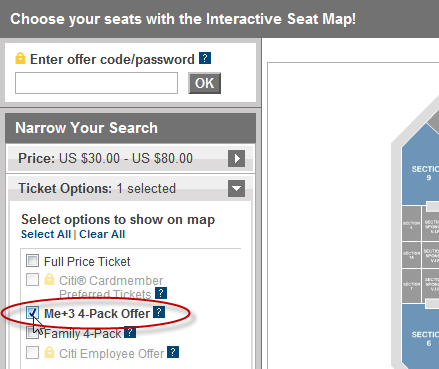 Did you know you can set your own price for re-sell on any online tickets you buy on TicketExchange? 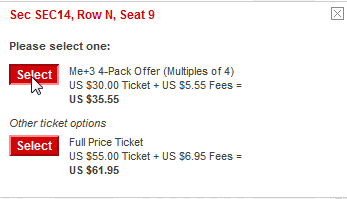 Tickets are bought and sold cheaply here every day, but not many people know it even exists. 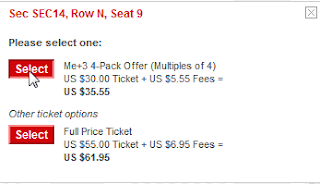 Other fans may post up their extra tickets for a great deal that you may want to attend. Sat, Aug 4 is Military Appreciation Day - Free entry for all active duty and retired members, family. Plus our heroes get free 2-for-1 tickets, any day of the week. See all special events days here. If you followed my advice and still have that 50% Off Ticketmaster Gift Card we announced previously, you can save even more! It was a $100 TM gift card you could buy for $50. I recommend the Basil Chicken entree at the Thai place. Most of the staff are pretty friendly and seems like the business place in the food court area. Gets busy around lunch/dinner, so try to go early and get a place to sit!